Lidia Bastianich demonstrates fascinating recipes on Lidia’s Italy, her public access show. 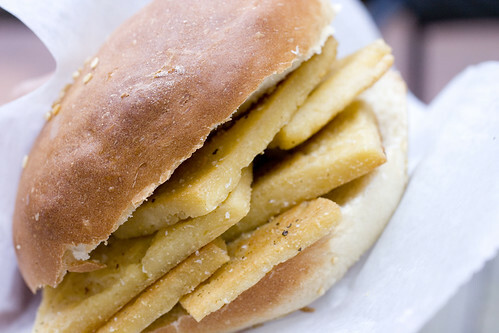 On a recent episode, 211, she featured a specialty of Palermo, a city in Sicily, Italy: the Panelle Sandwich. Jessica and I watched and drooled as Lidia and her nephew went around eating this rustic street food at different stands, wishing we were in Italy. When Jessica made some hamburger buns, it jogged my taste memory. 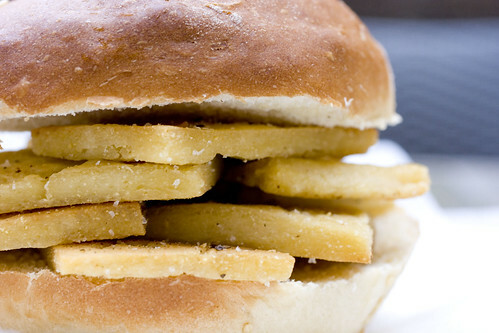 They looked perfect for the panelle sandwich because Lidia mentions that they are always served on sesame seeded buns. I found Lidia’s recipe for Fried Chickpea Polenta (Panelle), but it was a bit large, and I recalled hers came out too thick, so I reduced it for my purposes. 1. Oil or spray a 9″ x 13″ baking sheet, set aside. 2. Begin heating water, oil, and salt in a heavy 1 quart sauce pan over medium heat. Slowly whisk in chickpea flour as combination heats, breaking up lumps. Stir continuously for 7-10 minutes, while a pudding-like consistency is achieved (do not let it boil). Actually, it if you’re into baking, this should closely resemble heating pâte à choux batter. 3. 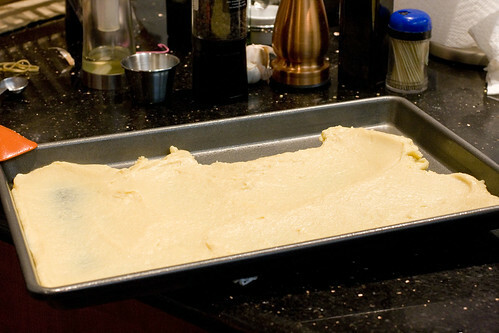 Remove immediately to the baking sheet and spread smooth. Work quickly as the batter will set rapidly. Let air cool for 2 hours. Refrigerate up to overnight. 4. Later, cut the cooled panelle sheet into strips, about 1″ wide by 2.5″ long, a bit smaller than a business card. Heat extra virgin olive oil in a heavy bottom pan, but don’t let it smoke. 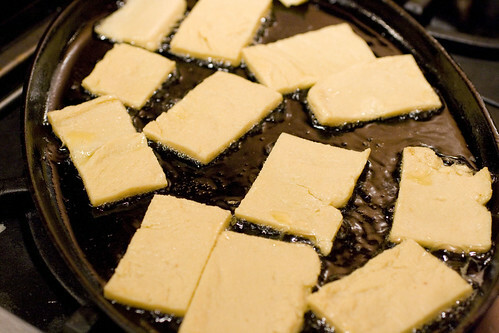 Fry the panelle strips until golden, season with salt and pepper, and eat hot or room temperature on a soft bun. Next time I might consider adding herbs (oregano or parsley perhaps, like this person) to the panelle batter. Consider adding black pepper, mayonnaise, or hot sauce to the sandwich; or just a squeeze of lemon. posted by Lon	at 08:45 AM	Filed under Italian, Recipes. You can follow any responses to this entry through the RSS 2.0 feed. Both comments and pings are currently closed. Wow, I’ve never seen this before! It looks great! That looks like a scrumptious sandwich! Panelle is new to me, would love to try sometime. Is that 4 oz of flour correct – it seemed like she used more than that? Paul, yes, this recipes is scaled down. Oh my God, this looks amazing!!! I’ve had polenta before, but never thought to make it into a sandwich. Wow. I’m quite speechless. Patti, I was quite surprised too, to see this as a popular street food of Palermo. Funky huh? 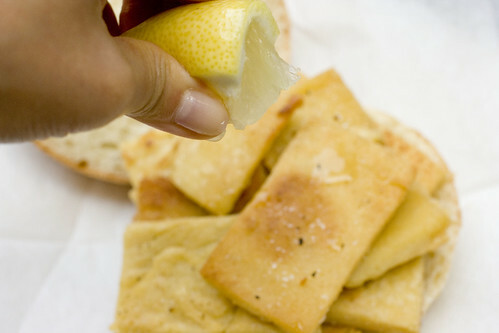 Dear Panelle Ladies, I’ve tried 3 times now to make this recipe, both Lidia’s full size and your half size. Everything goes well until I tried to fry the panelle. They fall apart in the hot oil into little oily globules. I am not sure what I am doing wrong. I live at 6000 feet above sea level, but I generally do not have problems with fried foods. I included a little chopped parsley in the batter, but I don’t think that’s the problem. I was able to salvage half of the last batch I made by baking them in a 375 F oven until golden brown instead of frying. Although I am half Sicilian, I had never heard of this dish before seeing it on Lidia’s show. Maybe because it’s harder to make than it looks? Mary Ann, I don’t have any experience with cooking at high altitude, but I’m wondering if the problem is the 2nd step, where the chickpea flour is cooked in water first. Again, no experience with the altitude but I’ve heard that water boils at different temperature so maybe that is the part affecting it, though I don’t know how to fix it. Sorry. Thank you, Jessica. I am going to see if I find a food science whiz at Colorado State University who can solve this. If I find a solution, I’ll post it here. The baked panelle I made were pretty tasty, so I do have a fall back plan. Ciao! Mary Ann – Sorry to hear the recipe is not working out, but it’s worth trying! While I don’t have any experience cooking at high altitude either, I can give a few ideas. Looking at my recipe there seems to be three potential trouble spots altitude could affect: flours are drier in high altitude, water boils at a lower temperature, and food cook faster in fat. The first two would indicate that you need to boil the chickpea flour longer, so that the flour absorbs enough water and fully cooks. If you have ever cooked “Cream of Wheat” the consistency should be similar. It could be that you over- OR under- cooked it. My guess would be that if the cakes flaked apart in the oil, you under-cooked; if the cakes were goopy, you over-cooked. The third would indicate that the outside of the panelle fried much faster than the inside. I think your approach was what I would do too, bake the sheet off. However, then I’d try to fry them, but at lower frying temperature. I love Panelle! I had them for the first time last year while in Palermo. I fell in love. Some vendors add herbs such as parsley (most common), others use rosemary which is also fantastic. I had panelle again very recently while on vacation in Sicily and had to get more than my fill of these treats. When I make them at home I always add parsley. I like to kick it up a notch by adding a clove or 2 of minced garlic and sometimes I add some lemon zest. Always serve them with fresh ground black pepper, salt and a squeeze of lemon! A must is a soft sesame seed topped bun! Thanks Lee-Ann, we’ll try parsley next time…and hopefully, we’ll have the real deal in Italy soon.